British boxer Tony Bellew says he held talks with the UFC regarding a fight with Michael Bisping last year. 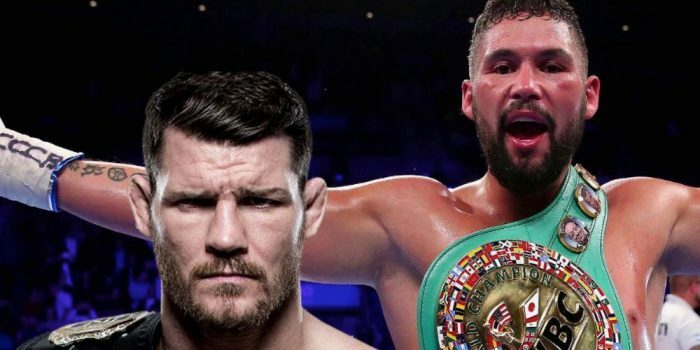 Boxer Tony Bellew has a huge rematch with David Haye coming up on May 5, but this morning he’s been talking about stepping foot into the UFC Octagon. Last year during all the Mayweather vs McGregor fanfare, Bellew made no secret about wanting to take on Michael Bisping. Speaking this morning on TalkSport radio, Bellew revealed that he’d been approached by representatives of IMG (now Endeavour) about whether he was serious or not about having a fight in the UFC Octagon. “At the Conor McGregor vs Floyd Mayweather fight, I had a sit down with a couple of guys. According to the Liverpudlian, if the two did ever share the Octagon with one another it would be Bisping left staring up at the lights. “He would go fast asleep. He would just go co-cozing immediately. “I’ve got all the respect in the world for Bisping, it wouldn’t cross over to be nasty or anything.